Verdict - An Elaborate Lesson On Journalism Ethics That Makes Up For A One Time Watch! How many times have you heard terms like Presstitute, Sold Media or Fake News ? A lot of times I guess. With the advent of digital journalism, researching and spending time into a story has reduced significantly. Journalists or common man too for that matter, break news or post stories without proper research and verification, not realizing the effect that it can have on the people. That is one point that you will find being over emphasized in the movie- a long lecture on the ethics of journalism. It has been stressed so much that not once but twice was it stressed in the movie. To a point it was ok, but then it got a little OTT. Noor is about a university topper who is trying to get into some 'serious journalism'. The way she treats entertainment journalism is something I really did not feel happy about. I mean hi, there, art and culture is as important a part of the society as anything else. But that is not the only problem this movie has. The relation between Noor and her Boss was way to utopian. You cannot get away with shouting at your boss, when the fault is yours, and then suddenly gate crashing at his private dinner! And why are all the journalists in the film Bengalis is something I couldn't figure out yet! The Bridget Jones style storyline looked pretty and great in the beginning. Every girl out there could absolutely relate to the everyday struggle that Noor has to go through. From balancing between personal and professional life to balancing your body weight, it was all bang on. Till interval, it was a good journey but post it, the pace slackened and the journey was just downhill. I have not read Saba Imtiaz's 'Karachi You're Killing Me' from which the film has been adapted, so I have no idea how much it sticks to the book. It was really pleasant to see Sonakshi taking the film on her shoulders completely. In fact she is the only round character in the film. And it is way better than her previous woman centric movie 'Akira'. It is sparky, breezy and light but the second half will leave you disappointed. Purab Kohli looks attractive, and so does Kanan Gill and Shibani Dandekar, but they have very little flesh in their characters. The movie is a one time watch that you might think about watching this weekend! Journalism is perceived as a very fancy and fantastic profession when it comes to chose it as your career, but trust me it's not. It is as competitive as it is to be an engineer or doctor. So the movie is based on the Novel "Karachi You're Killing Me" by a Pakistani writer. The story of a young Journalist Noor Roy Chaudhary played by Sonakshi Sinha, to be successful as a serious Journalist with some real stories of real people, but what she is doing now is completely reverse of that. She hates everything in her life, be it her weight, her love life or be it her work life. Neither she is able to lose her weight, nor able to get a boyfriend. She works in a news agency and constantly tries to convince her boss to publish some of her stories but is never accomplished in her mission. The only people she hangs around with, are her childhood friends Saad and Zara. Her life takes a drastic turn when she got an investigative story to fulfil her dream. The story deals with the ethics in Journalism and in the real world. 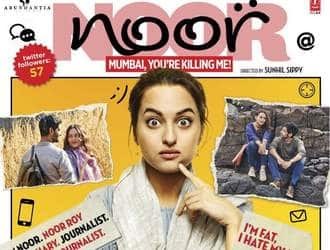 Noor ( Sonakshi Sinha)introduces herself as a looser,a failed journalist,a wayward negative personality and a dissatisfied woman.She spends over four hours daily commuting in her Nano car.She is living on birrowed funds.Her potential in TV journalism is being cut short by her own editor( Manish Chaudhari).She aspires to be an investigative journalist,instead put on 'soft insignificant assignments' ,like interviewing Sunny Leone.All her three relationships are failed one's.She even leaves her job.What next? Here's a twist. It's a chance factor that she unearths a scooping story from the bitter experience of her own maid( Smita Tambe).What is it? Is it worthy of being aired ? Why are all the victims quiet ? As the film progresses ,Noor gathers the courage to unravel many more powerful and contemporary stories .By now she has realised the power of media as a 'truthful vigilante'.Does she succeed? To me there are three layers in the presentation.One,journalism is a serious profession .It should be carried out in a professional manner.Two,never share your stories with fellow beings.Often stories are 'lifted' and presented as their own without an infringement of copyrights.Three,a journalist must unravel the truth despite pulls ,pressures and threats being exercised by the vested interests. Two one liners are worthy of being inserted-"Brave are those who speak the truth on camera ,not those who have covered the story";"It's easier to get Supari killings done,than finding a suitable match". Where Noor fails- How could Noor cope up with mere Rs ten thousand in her kitty after resigning from her job?To me, woman emancipation can go through only when she's economically empowered and not by mere lofty ideals and a streak of feminism.There was ample scope in the story to present the film in a thriller format,instead it turns out to be a documentary for those who intend joining journalism as a career. Just an observation.Noor does hint at the 'video format social media' as the in thing.Majority of us have smart phones.Unedited anonymous stories are being watched on the cell by millions.Not many have the time to read newspapers nor watch TV .Many doubt the credibility of edited one sided slant given to stories in print and on the small screen.Social media ensures stories are not lifted and the credit is given to the vigilante. Noor is based on the book Karachi, You're are killing me! written by Saba Imtiaz about the life of a young journalist in Karachi. I don't recall much of the book but I remember loving its zany and breezy style of writing that evoked Karachi for me as it sketched out the perils and problems of the young woman. Noor is a young journalist in Mumbai and she is the most boring person you are likely to meet. She has two friends - a guy who runs a swish restaurant in London and a swank girl who is a DJ. She barely hangs out with these two, preferring to spend her time yelling at the maid to fix the geyser or bemoaning her lack of a love life. Which she can't have if she continues to be a recluse. Her job is a dead end and then things lighten up when she finds a dishy boyfriend and a headline grabbing news story. Will her life turn from boring to happening and will we be spared scenes of her being wrapped up in her blanket with chocolate cake artistically smeared around her mouth? I'm afraid not. All this non-happening takes over the first half till you are squirming with impatience. The second half will have all the action I nod wisely to my mother who has come to watch the movie with me. See? Nothing has happened so far, it will all get squished into the second half. She nods warily with the wisdom of someone who has seen life. We wait for the action to begin. After all there is a kidney stealing racket to be exposed, research to be done, people to be interviewed, sleuthing needed to expose the culprit. But no, instead our journalist after a round of sulking in London, comes back, interviews a few people and then launches on the most boring monologue that exposes her thakela personality. Called 'Mumbai you are killing me', it goes on and on about the ills of the city blah blah blah. Surprisingly, the video goes viral proving the world has its fair share of people with nothing to do but watch long videos of girls cribbing. So, then all ends well and Noor is on the path to a successful career and gets her guy. Noor has a weight problem which gives license to Miss Dumpling Sonakshi to wear loose floaty clothes and sneakers. Her attempts at being cool and clever are pretty wasted and no, wearing glasses don't automatically make you intellectual. Kannan Gil as her best friend is cute to look at but needs voice modulation to sound less nasal which is kind of grating on the nerves. The other friend has nothing much to do except wear cool clothes and do some DJ stuff. Purab Kohli as the bewafa boyfriend is kind of ok. The only person who keeps this movie grounded is the lady who plays Malati the maid whose brother has his kidney removed. Without her this movie would have flown away like a kite in the monsoon breeze. "Noor" a film where you can watch Sonakshi Sinha in the shoes of (Noor Roy Chaudhary), a journalist who faces ups and down in the daily life. There is this actor named Kanan Gill, who plays the supporting role for Noor as Saad being her close and old best friend. So the story starts when the real struggle of Noor starts in the film. The "organ-trade racket" much like a big break for a junior correspondent who wants to get famous and achieve big in life through journalism, But if the story goes right just from the beginning who is going to watch this film? Here, I mean to say that nothing goes well with Noor when it comes to making big in her life. Sunhil Sippy made it clear right from the beginning that this is going to be female oriented movie. And through his proper direction he proved it that the decision that he made was all right. Somewhere to showcase the life of a journalist in the moving city like Mumbai, Sunhil Sippy served with some over the top things in the character of Noor. Apart from that, Noor film can prove to be a big break for actress sonakshi Sinha, because she is the only leading personality in the film who kept the scenes go on and on, on her own, which apparently is a difficult thing to manage. And Sonakshi did it so well. Being a simple and precise story the film has the scene plotting so obvious, and due to the trailer it was not unexpected, which is fine. The story is much more than noor's habit of getting drunk over old rum and having a hangover the next day. A newsroom which is shown in the film delivers a wrong message to the audience, because this is not how Journalists EXACTLY works or talks to the boss. Although this short and crisp story of the film delivers a nice message about TIME to everyone. I am sure you would relate to anyone of the characters of this film because this movie has captured the basics of all of us.